This course provides a deep understanding of the operating system architecture and low-level interfaces (principally, system calls and library functions) that are required to build system-level, multithreaded, and network applications on Linux and UNIX systems. The course consists of a mixture of detailed presentations coupled with a large number of carefully designed practical exercises that allow participants to apply the knowledge learned in the presentations. By the completion of the course, participants will have the mastery needed to write complex system, network, and multithreaded applications on a Linux or UNIX system. Previous system programming experience (on Linux, UNIX, or any other operating system) is not required. A more detailed list of topics can be found here. The course includes extensive practical programming sessions. Come along prepared to work fairly hard, interact, and learn a lot during the week. By default, the course is oriented towards Linux, but (as in The Linux Programming Interface) the Linux-specific material is clearly delineated. The course is thus also useful to attendees working on other UNIX systems such as FreeBSD, Solaris, HP-UX, and AIX. If you elect to have an onsite training course on your premises, it is possible to determine the length and content of the course. The length and content of tailored courses is determined by your choice of topics, typically based on a subset of the topics in The Linux Programming Interface. Relevant topics that are not in the "Standard" list are also possible; see Alternative Topics in the course outline, and contact me if you have specific requests. Programmers developing system-level or network applications for Linux and UNIX systems, or programmers porting such applications from other operating systems (e.g., Windows) to Linux or UNIX. Embedded programmers developing applications for Linux, or porting embedded applications from systems such as VxWorks or QNX to Linux. At least a good reading knowledge of the C programming language. The content of the course is applicable in a range of compiled programming languages, such as C++ and D, and scripting languages such as Perl, Python, and Ruby, and participants are welcome to use their preferred language in the lab sessions. A basic knowledge of the more commonly used functions in the standard C library. For example, it's assumed that participants know what the common functions in the stdio and malloc packages do. A knowledge of basic UNIX/Linux shell commands. A basic knowledge of make(1) is helpful, but not essential. Note: previous system programming experience is not required. The course employs a lecture+lab format. A significant part of the course is spent on practical exercises. The lab sessions also provide participants with the opportunity to obtain one-to-one assistance from the trainer on the course material and exercises. The course books have been developed by the trainer, and they are constantly updated based on ongoing changes in the Linux kernel, the GNU C library, and the POSIX standards as well as practical teaching experience in courses. The course books are printed on demand: typically, a new version is printed for each course. The course books are closely integrated with The Linux Programming Interface (TLPI), via numerous references to precise locations in TLPI with more detail on various topics covered in the course. The course books include many example programs and exercises not found in TLPI. 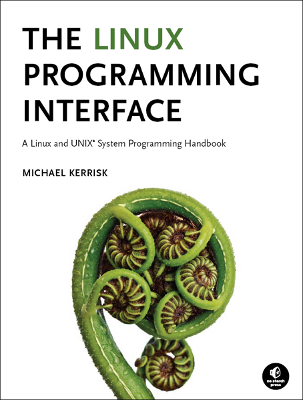 In addition to the course book, participants will receive a copy of The Linux Programming Interface, in either ebook or printed form (or, when possible, both). Part of the File I/O course module. POSIX Shared Memory course module. The epoll section in the Alternative I/O Models course module. By the end of the week, participants are in a position to write programs that solve some fairly strenuous exercises, such as this client-server exercise from one of the sockets modules. He is actively involved in Linux development—working with kernel developers on testing, review, and design of new Linux kernel-user-space APIs. Since 2004, he has been the maintainer of the Linux man-pages project, which provides the manual pages documenting the Linux kernel-user-space and GNU C library APIs. For more information about the trainer, as well as many reasons why you might want to consider choosing man7.org training courses, please look here. For public 5-day courses in Munich, GERMANY, the per-person price is €2700 + German VAT (MWSt). The price includes the cost of training materials as well as lunch and refreshments. Discounts are available for multiple attendees from the same company or organization; please inquire at training@man7.org for details. For public courses in San Francisco, the per-person price is US$3400. The price includes the cost of training materials as well as lunch and refreshments. Discounts are available for multiple attendees from the same company or organization; please inquire at training@man7.org for details. For tailored onsite courses at your location, email training@man7.org regarding availability and rates. If you would like to be added to a mailing list to receive notifications of public training courses that are scheduled in the future, send a mail (noting your location) to training@man7.org. Likely future locations are Europe and USA West Coast, but other locations may also be possible, especially if they can be scheduled to coincide with an interesting conference.